Desborough Town will be looking to maintain their bid for a high finish in the Future Lions United Counties League Premier Division when they take on Eynesbury Rovers at the R Inn Stadium tomorrow (Saturday). Ar Tarn go into the clash on the back of three wins in a row while they are unbeaten in their last six league matches. Their latest success was on the road at Peterborough Northern Star last weekend as goals from John Dean, Dan White and Jason Turner secured a 3-2 victory. Wellingborough Town sit just behind Desborough in the league table and will be looking to bounce back from a 2-1 defeat at Holbeach United last time out when they face the tough task of taking on leaders Daventry Town at the Dog & Duck. The match with the table-toppers comes just 11 days after Gary Petts’ team claimed an impressive 1-1 draw against them away from home. There is a big game towards the other end of the table with bottom markers Whitworth hosting ON Chenecks at London Road. The Flourmen are four points adrift of safety following their 4-0 loss at Daventry last Saturday. 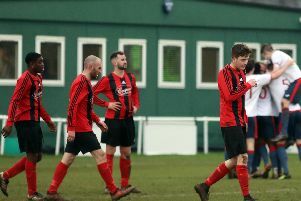 Rothwell Corinthians remain third-from-bottom after they claimed a good 2-2 draw at Leicester Nirvana and they face county rivals Cogenhoe United at Sergeants Lawn this weekend. The situation at the bottom of Division One remained unchanged last weekend. 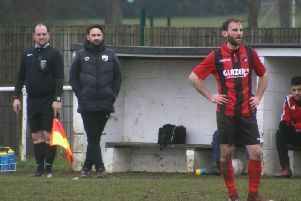 Raunds Town’s recent revival came to a shuddering halt after they were thrashed 7-0 at Harrowby United and the bottom markers will be hoping to bounce back when they play Bugbrooke at Kiln Park tomorrow. But Thrapston Town and Burton Park Wanderers also remain in trouble. Wanderers suffered a 2-0 loss to local rivals Irchester United with Josh Burge and Thomas Gordon scoring the goals for the Romans. Thrapston made a fine start against Lutterworth Athletic with Liam Bulmer putting them in front after just two minutes but the visitors hit back to win 3-1 at Chancery Lane. Thrapston make the short trip to Irchester this weekend while Burton are on the road at Melton Town. Rushden & Higham United, meanwhile, will be looking to bounce back from their 2-0 defeat at leaders Lutterworth Town last time out when they return to Hayden Road to face Holwell Sports.